Diesel fuel has long been the primary source of energy in Arctic communities. In this harsh environ, diesel is, above all else, reliable – an important characteristic in 24-hour darkness and -40C temperatures. Unfortunately, this reliability has high logistical, financial and environmental costs, hindering the self-sufficiency and independence of remote communities. Habitat-friendly renewable energy from solar and wind offers a cost-effective way to reduce reliance on fossil fuels, ensure the Arctic marine environment isn’t harmed by spills, and increase independence for remote communities in the North. 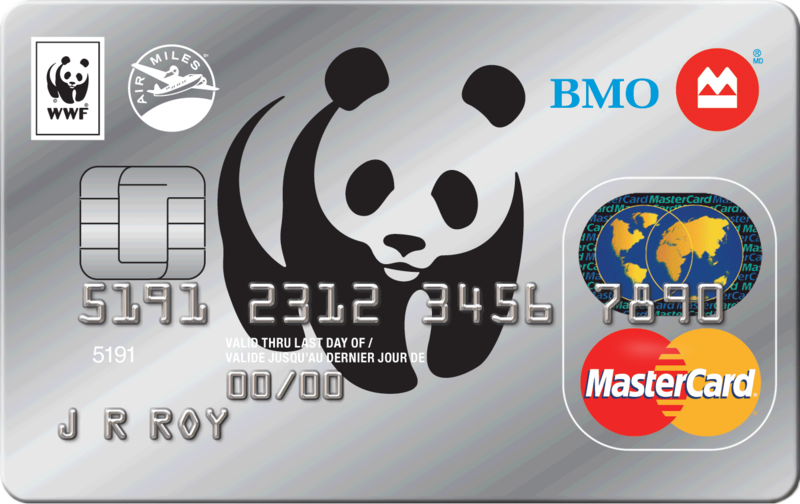 WWF-Canada’s research into habitat-friendly renewable-energy use in the Arctic shows this transition can be cost-effective. This is an important first step in supporting energy stability in the north that is free of risk to marine and other environments. To date, there are very few renewable-energy projects in the Canadian Arctic, and in most cases the wind turbine or solar-panel installations are not large enough to make a substantial dent in diesel use. Some reports and newspaper articles have suggested that the incredible cold and harsh conditions in Nunavut make it an unlikely host for more substantial projects. Alaska is proving, however, that it is possible to install large-scale, successful projects in challenging Arctic conditions. 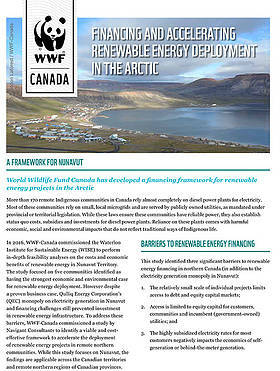 With Alaska’s successes in mind, WWF-Canada is working with communities, energy and policy experts, utility companies and governments to expedite the transition to renewable energy in northern communities to demonstrate that habitat-friendly renewable energy is reliable and robust enough to power our future in communities across the country. 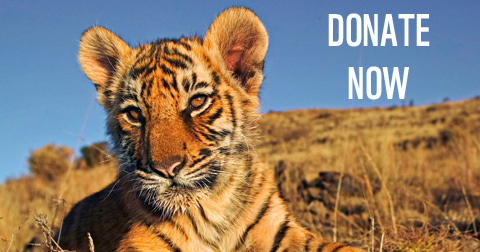 As a critical step in slowing climate change, investment in a mix of renewable energy in northern communities protects species and habitat by reducing carbon dioxide emissions. Furthermore, deployment creates economic opportunities at the community level, and reduces diesel power plant operations and maintenance costs. 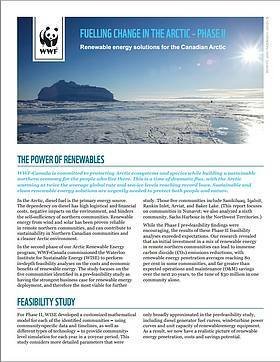 On behalf of WWF-Canada, the Waterloo Institute for Sustainable Energy, a world-class clean-energy research group, performed the pre-feasibility study on the 13 most promising Nunavut communities to predict what the use of renewable-energy sources in northern community grids could achieve. Based on this research and collaboration with key stakeholders, five communities have been identified as having an especially strong business case for renewable energy deployment. Work with governments, experts and community leaders to create a replicable, scalable and self-sustaining deployment model for renewable energy investments to reduce dependence on diesel in Arctic communities. Deploy low-impact, community-wide habitat-friendly renewable energy technologies in three candidate communities by 2020. 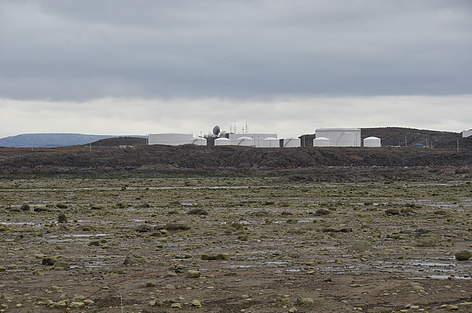 Fuel tanks dot the landscape in Iqaluit, the capital city of Nunavut. In each of the five identified communities, an initial investment in renewable energy would be paid for by reduced diesel-energy costs. The Hamlet of Sanikiluaq has the maximum energy savings (45 per cent) as well as associated renewable-energy mix (52 per cent) and reduction in carbon dioxide emissions (53 per cent). The other four selected communities include Iqaluit, Rankin Inlet, Arviat and Baker Lake. WWF-Canada is working with an Arctic renewable energy expert committee to demonstrate that renewable energy is viable in the Canadian Arctic. It is our goal to see community-scale renewable energy projects in at least three northern communities by 2020. We are focusing here on community-scale energy projects with comparatively low generation capacity (as opposed to large-scale industrial energy production for regional or international transmission, for which our high conservation value framework approach for habitat-friendly renewable energy should be applied). These community-scale projects have relatively small footprints and low potential for ecological impacts, especially since the majority would be either in or close to existing towns. WWF-Canada co-hosted an Arctic Renewable Energy Summit in Iqaluit – with the federal government, Nunavut Territory and Qulliq Energy Corporation – to discuss results from this study and explore challenges and opportunities involved with renewable energy development in the North. 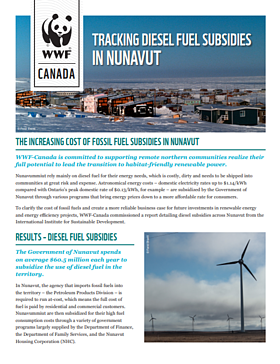 One of those challenges, identified in a report by Pembina Institute (commissioned by WWF-Canada), is the artificial cost of diesel, kept low through a tangle of multiple subsidies from various levels of government. In response, we have commissioned new research to peel back the layers of subsidies for the purchase, delivery, storage and power-generation of diesel for remote Arctic communities, and thereby reveal the true cost of diesel. This new research, being undertaken by the International Institute for Sustainable Development, will begin with Nunavut. By uncovering the pre-subsidy cost of diesel, utilities and communities will be able to make informed decisions about the true cost of fuel when deciding between a clean or dirty energy source. Investment in a mix of renewable energy in northern communities can lead to significant carbon dioxide emissions reductions and energy operations and maintenance cost savings. Climate change solutions are all around us – from the smallest communities to the harshest environments.